Some things speak peace and beauty into your soul without words. 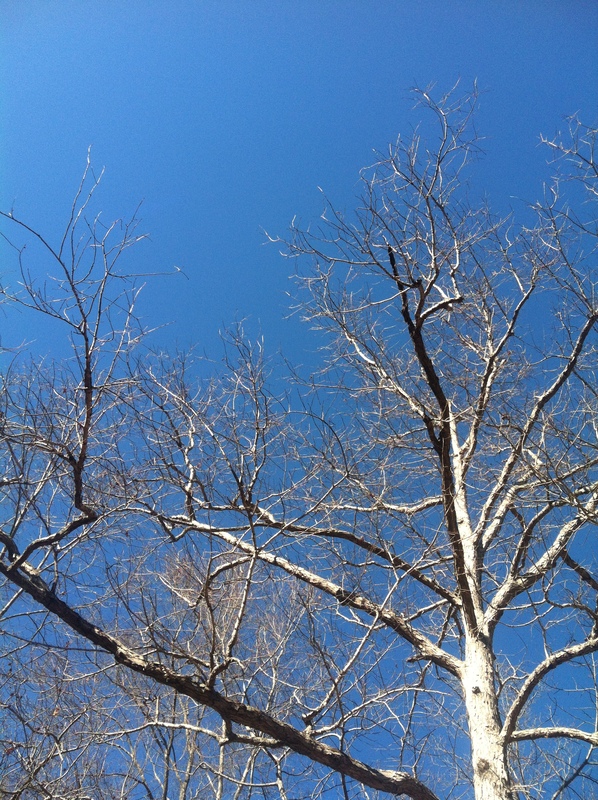 Winter-blue sky, for example. Sky that is the purest, most beautiful shade of blue is something to get lost in. The wild morning glories of spring along the roadways sometimes capture the azure quality of the sky. It’s the kind of blue you want to breathe in: the color of peacefulness, never the blue-gray of sadness. Sunlight consists of all the colors in the light spectrum: red, orange, yellow, green, blue, indigo and violet, woven continuously together. Unlike paint, when all the colors of light blend, they appear to form white light. When this blended light shines through raindrops, a prism effect results, and the individual colors split and become gloriously evident. The very first rainbow resulted from the genius of God’s creation and spoke of His promise to never again flood the entire earth with water. Molecules in the air intersect the sunlight before it reaches our eyes. The molecules scatter the high frequency blue light more than they scatter the other colors which have lower frequencies. (This is called Rayleigh scattering, after John William Strutt, 3rd Baron Rayleigh, English physicist 1842-1919 who studied this phenomenon. Albert Einstein subsequently refined the idea). This scattering of blue light is what produces the blue sky color our eyes were designed specifically to see. Great minds have contemplated the mysteries of light and air and understand many of the laws that make things so; but there is One who breathed out creation and all the parameters that govern it, long before the mind of man tried to understand it. God is the Author of Creation and the Author of Salvation. He hates sin but desires peace. Sin angers Him, but mercy defined His action when He caused His Son to die for us. The daylight sky darkened when Jesus gave His life, but peace burst forth when the temple curtain was torn in two, top down, symbolizing that the sin debt which separated God from man was paid in full. Jesus Christ is the way to blue-sky peace with God. The only way. If you have found the Way, and see the Light, how will you scatter blue-sky peace to others, so that they, too, may see? Drink it in. Breathe it in. Then, scatter it through the words of your mouth, the works of your hands and the integrity of your character.